Export: Publish automatically only on given dates (e.g. month ends)? I'd like to be able to automatically publish an .IOK output at each month end (timestamped - but I already know how to do that). Is there a way to do this? 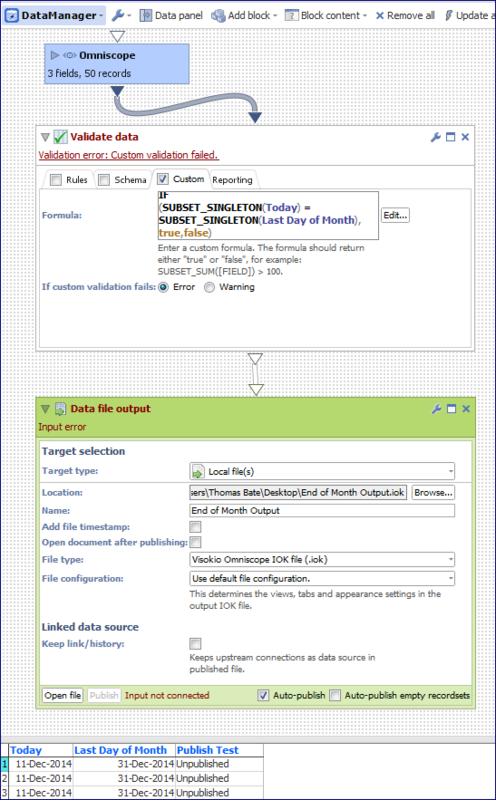 Omniscope features a Validate Data block which can be used to control flow based on evaluated results. As shown below and in the attached example, the above formula can be inserted in the Validate Data block such that it will return 'true' only on the last day of the month. The other days, it will return 'false' and when the Validate Data block is set to return Error on 'false', no data set will pass onwards to the Output block for Publishing. You can configure an error email to be sent saying effectively "Nothing published because today is not the last day of the month"
which evaluates the same as a single values rather than as multi-row results. Thanks tjbate. Subset_singleton didn't work for me since I was working with more data rather than just a mapping table like your example, but Subset_last did what I wanted it to (because of the way my data was laid out) so I got what I wanted out of it.